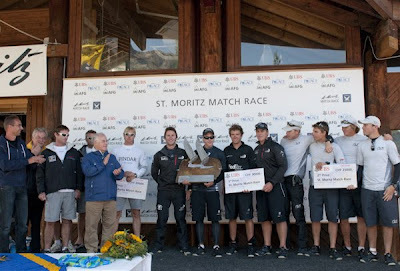 ETNZ/BlackMatch win St. Moritz Match Race 2009 ahead of the Mirsky Racing Team from Australia. Minoprio triumphed in the first to score two point final. St. Moritz, September 6, – The last day of St. Moritz Match Race proved to be a tricky one for both the organisers and the competitors. The Northerly breeze was blowing very inconsistently, forcing the Race Committee to cancel many start procedures during the final series between Adam Minoprio (NZL, ETNZ/BlackMatch) and Torvar Mirsky (AUS, Mirsky Racing Team). The final race eventually took place in good conditions allowing the Kiwi sailor - number 1 in the ISAF world ranking and now once again leader of the Tour - to beat his Australian opponent and to grab the title of King of the Mountain 2009. The two previous races took place in a very light and shifty breeze. The “counter-performer” of the day is Philippe Presti, who lost the “Petit” final to Ian Williams (GBR, Team Pindar). 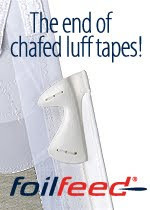 The French skipper was unsurprisingly quite disappointed by the outcome of the regatta. He was stalled at the start of the last race leaving Williams to sail away and never managed to get back into the race. Presti nevertheless left St. Moritz with a smile he seemed to have come to terms wth the disappointment of this last race. Mathieu Richard (FRA, French Match Racing Team), King of the Mountain in 2008 wasn’t very happy either with his performance as he was eliminated before the quarter-finals. Adam Minoprio, the winner of the title and new King of the Mountain joins a prestigious list of winners that includes Mark Mendelblatt (2003/2004), Ed Baird (2005), Paolo Cian (2006), Ian Williams (2007) and Mathieu Richard (2008). Minoprio becomes the sixth different winner in six years to claim the trophy. Minoprio also takes back the lead of the Tour leapfrogging Mathieu Richard to a 12 point lead over Torvar Mirsky who moves up to second place and dropping frenchman Mathieu Richard to third. The next event on the Tour is the Danish Open starting on the 10th September.